Porsche needs cash to cover debt built up buying a majority stake in VW. LONDON (Reuters) -- Porsche is amending the terms of a 10.5 billion euro ($15.06 billion) syndicated loan to accommodate its planned merger with Volkswagen AG, two senior bankers said on Monday. Porsche Automobil Holding SE is seeking to reduce the loan to 8.5 billion euros within its three-year maturity, the bankers said, using the proceeds of the sale of 42 percent of its Porsche AG sports car unit, one of the bankers added. 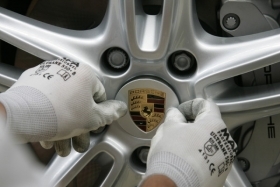 Porsche is still discussing the terms of the amendment and is hoping to produce a formal document by the end of September with a view to signing banks into the deal by mid-October, the two bankers said.